ტიურინგის პრემია (ინგლ. Turing Award) — ყოველწლიური ჯილდო დაწესებული გამოთვლითი ტექნიკის ასოციაციის (ინგლ. Association for Computing Machinery) მიერ. პრემია ენიჭება პიროვნებას „კომპიუტერულ საზოგადოებაში შეტანილი ტექნიკური ხასიათის წვლილისთვის“. გათვალისწინებულია, რომ „წვლილი უნდა იყოს ხანგრძლივი და ძირითადი ტექნიკური მნიშვნელობისა კომპიუტერულ დარგში“. ტიურინგის პრემია ცნობილია როგორც „უმაღლესი ღირსება ინფორმატიკაში“ და „კომპიუტერული ტექნოლოგიის ნობელის პრემია“. პრემიას სახელი დაერქვა ცნობილი ინგლისელი მათემატიკოსისა და ინფორმატიკოსის, ალან ტიურინგის პატივსაცემად. ტიურინგი ცნობილია, როგორც თეორიული ინფორმატიკისა და ხელოვნური ინტელექტის მამამთავარი. 2007 წლიდან 2013 წლამდე, ინტელისა და გუგლის ფინანსური მხარდაჭერით, პრემიას თან ახლდა ჯილდო 250 000 ამერიკული დოლარის ოდენობით, ხოლო 2014 წლიდან, Google-ის მხარდაჭერით, საპრიზო თანხა ერთ მილიონ ამერიკულ დოლარამდე გაიზაარდა. ↑ 1.0 1.1 A. M. Turing Award. ACM. წაკითხვის თარიღი: 2007-11-05. ↑ Dasgupta, Sanjoy; Papadimitriou, Christos; Vazirani, Umesh (2008) Algorithms. McGraw-Hill. ISBN 978-0-07-352340-8. , p. 317. ↑ Steven Geringer. 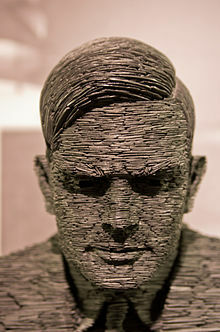 (27 July 2007) ACM'S Turing Award Prize Raised To $250,000. ACM press release. წაკითხვის თარიღი: 2008-10-16. ↑ See also: Brown, Bob. (June 6, 2011) Why there's no Nobel Prize in Computing. Network World. წაკითხვის თარიღი: June 3, 2015. ↑ Homer, Steven and Alan L. (2001). Computability and Complexity Theory. Springer via Google Books limited view, გვ. 35. ISBN 0-387-95055-9. წაკითხვის თარიღი: 2007-11-05. ↑ ACM's Turing Award Prize Raised to $1 Million. ACM. წაკითხვის თარიღი: 2014-11-13. ↑ Cacm Staff (2014). "ACM's Turing Award prize raised to $1 million". Communications of the ACM 57 (12): 20. .
ეს გვერდი ბოლოს დარედაქტირდა: 15:32, 1 იანვარი 2018.